MDC Alliance Goromonzi West parliamentary candidate Luke Tamborinyoka, who is accused of defacing campaign posters of fellow party member, yesterday said the allegations were fabricated by his rival who was expelled for going against party directive. 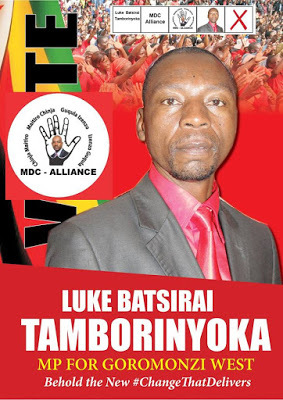 Tamborinyoka (46), who appeared before magistrate Francis Mapfumo, stands accused of defacing complainant’s posters, Taurai Nhamburo, who was expelled by the MDC Alliance for filing his papers with the nomination court without party approval. He told the court that Nhamburo was fired for forging the party’s national spokesperson Morgen Komichi’s signature in a bid to illegally submit his name to Zimbabwe Electoral Commission (Zec) as a candidate. Tamborinyoka, who was represented by Bosswell Chideme, submitted Komichi’s letter before the court, saying the party had since lodged a complaint with the police. “Despite my previous communication to you about the official party position regarding the Goromonzi West parliamentary candidature, I also note that you continue to disparage the official candidate with loud hailers across the constituency and that you are holding meetings and pasting posters, masquerading as the MDC Alliance parliamentary candidate in contravention of the official party position which has since been communicated to you,” Komichi’s letter to Nhamburo read. In denying the offence, Tamborinyoka told the court that he never set foot at the place where the offence was allegedly committed on the day in question. Nhamburo insisted that he was the official MDC Alliance candidate, but said he had not personally seen Tamborinyoka defacing the posters. Another witness, Noel Senzero said Tamborinyoka was the one who brought a ladder with his truck and pasted his posters on top of Nhamburo’s.